Wailea’s premiere gated oceanfront complex, the ultimate in first class ambiance. Peaceful, Serene, Private, Exclusive. Exquisitely appointed throughout, this stunning, spacious Penthouse unit features Travertine flooring, Granite counter tops, dual Sub-Zero refrigerators, Chiller drawers, Gaggano cook top & Viking grill For discriminating Chefs. Offered turn-key. Large Master suite, guest suite and den. Wailea’s newest and most luxurious beachfront condominiums offer world-class amenities including Concierge and Valet services, relaxing and peaceful adult infinity pool and spa, sparkling family pool, hot tubs, state of the art fitness center, underground parking, 24 hour security guard, guard regulated gated entrance, two entertainment lounges for private events, an elegant and informal game room with well appointed kitchen, fully accessorized business center and conference room are just some of the many amenities. Steps from the Top rated beaches on the globe! 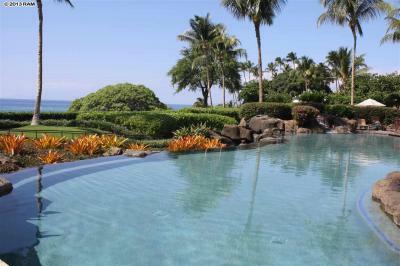 Wailea Beach Villas rests enviably on Wailea Beach, and is only steps away to the coveted “Shops at Wailea” for the finest in shopping , fine dining and the glimmering powdery white sand of world famous Wailea Beach. Walk along the beach path to enjoy world class dining, hotels, spas and ocean activities. Golfers Haven. Oceanfront Luxury.